HÀ NỘI — Referee Trần Xuân Nguyện and his assistant Phạm Phú Hưng have been sidelined due to mistakes made during a V.League match between Hoàng Anh Gia Lai and FLC Thanh Hóa on Saturday. Hưng was said to have been standing in a wrong location on the field, resulting in his not identifying Hoàng Anh Gia Lai’s Ngọc Quang’s off-side position, when he sent a ball to Văn Thanh, who then scored a goal for the hosts, Hoàng Anh Gia Lai. 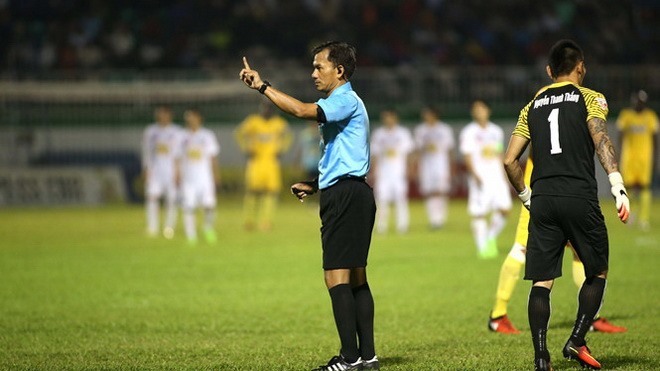 Meanwhile, referee Nguyện made serious decisions, including issuing a second yellow card to Hoàng Anh Gia Lai’s midfielder A Hoàng, a key reason leading to the hosts’ 2-3 defeat. He also ignored two penalties by Hoàng Anh Gia Lai when their strikers fell in the box area. "I feel confused at this moment. I am still thinking a lot about the match. It is a heavy pressure job, but I have accepted it," said Nguyện.